For other uses, see Midnight (disambiguation). Midnight marks the beginning and ending of each day in civil time throughout the world. 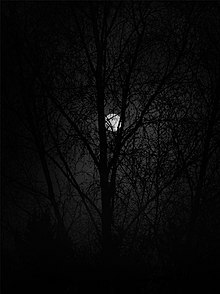 As the dividing point between one day and another, midnight defies easy classification as either part of the preceding day or of the following day. Though there is no global unanimity on the issue, most often midnight is considered the start of a new day and is associated with the hour 00:00. Even in locales with this technical resolution, however, vernacular references to midnight as the end of any given day may be common. Strictly speaking, it is incorrect to use "a.m." and "p.m." when referring to noon or midnight. The abbreviation a.m. stands for ante meridiem or before noon, and p.m. stands for post meridiem or after noon. Since noon is neither before nor after noon, and midnight is exactly twelve hours before and after noon, neither abbreviation is correct. However, many digital representations of time are configured to require an "a.m." or "p.m." designation, preventing the correct absence of such designators at midnight. In such cases, there is no international standard defining which arbitrary selection is best. In the United States and Canada, digital clocks and computers commonly display 12 a.m at midnight. The thirtieth edition of the U.S. Government Style Manual (2008), in sections 9.54 and 12.9b, recommended the use of "12 a.m." for midnight and "12 p.m." for noon. However, the previous 29th edition of the U.S. Government Printing Office Style Manual (2000), in section 12.9, recommended the opposite. There is no further record documenting this change. The US National Institute of Standards and Technology (NIST) recommends avoiding confusion altogether by using "00.01 am" and the date instead of "midnight." There are several common approaches to identifying and distinguishing the precise start and end of any given day. Use of a 24-hour clock can remove ambiguity. The "midnight" term can be avoided altogether if the end of day is noted as 24:00 and the beginning of day as 00:00. While both notations refer to the same moment in time, the choice of notation allows its association with the previous night or with the following morning. This approach follows the 24-hour time specification of ISO 8601. "Midnight" can be augmented with additional disambiguating information. A day and time of day may be explicitly identified together, for example "midnight Saturday night." Alternatively, midnight as the division between days may be highlighted by identifying the pair of days so divided: "midnight Saturday/Sunday" or "midnight December 14/15." The approach recommended by the NIST ("12:01 a.m." or "11:59 p.m." instead of midnight) can be particularly helpful when any ambiguity can have serious consequences, such as with contracts and other legal instruments. A clear convention may be legally defined or culturally promulgated. Associating midnight with 00:00 and the start of day is one option that has the benefit of aligning with many religious calendars which singularly define a start of day, such as the Hebrew calendar and the Islamic calendar. As noted above, however, such conventions or definitions may not be uniformly observed. ^ "U.S. Government Printing Office Style Manual Chapter 9". 2008. Retrieved 2009-06-11. ^ "U.S. Government Printing Office Style Manual Chapter 12". 2008. Retrieved 2009-06-11. ^ a b "How to use a.m./p.m. vs. noon/midnight". National Institute of Standards and Technology. February 4, 2010. Retrieved 2012-09-02. Wikimedia Commons has media related to Midnight.